Every year we make the trip to Cape May Point Park and visit the Cape May Lighthouse to officially start our summer season. It’s an easy climb to the top after climbing the 199 steps. As you reach the top of this majestic structure you will have a breath taking view of the Atlantic Ocean, St Mary’s by the Sea retreat, and view the most southern tip of New Jersey looking out onto the entrance of the Delaware Bay as it meets the Atlantic Ocean. As you near the last few steps, you can run your hand against the old wooden door and feel the uneven wooden steps that have worn and served as a steady platform for over 100 years as the many light keepers made their way to service the Cape May Lighthouse. You can also see the original red painted cast iron door that has withstood the fierce cold Atlantic storms. As you approach the top you will walk past the original installed port hole windows that have held strong against the many fierce Nor’easter storms over this last century. It’s hard not to think of the lonely light keeper standing vigilant at the Light as the storms glazed the etched glass from the hard blowing sand and ocean salt spray. If you choose not to climb the light, the Cape May Park offers very good hiking trails and you also have easy access to the beach and rest rooms. 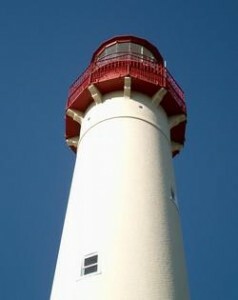 Please keep in mind that Cape May Lighthouse is part of the Cape May Pointe State Park. This is a major migratory stop over for many species of shore birds and the Monarch Butterfly. As you continue down Sunset Drive to the Sunset Point you will be able to visit the famous sunken concrete ship SS Atlantus and hunt for Cape May Diamonds on the beach. Every evening Sunset Point Gift Shop holds a flag ceremony honoring our Veternes at sunset, as they play God Bless America. The Flags that fly overhead all once draped a veterans casket in honor. As we end our day at the beach, as the hot summer sun sinks into the Delaware Bay while listening to old scratchy record playing over the loud speaker, we embrace the simplicity of lives at the Jersey shore and say thank you to all of those before us that have helped to preserve our rights to enjoy these special times with our family. This entry was posted in Cape May Resort Blog and tagged Cape May Lighthouse family Fun tings to do, Cape May Lighthouse July Events, Cape May NJ Lighthouse Family Things and activities, Family Fun Cape May Light House, Kids Climb Free Cape May Lighthouse on July 9, 2013 by Ryan Reclaim.